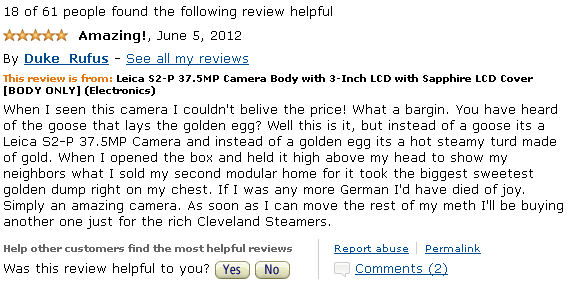 Found this one on Amazon, looking at a ridiculously high-end camera to which the Muddled Rambler had posted a link. Most of the reviews are pretty funny, but this gem stood out. Did you see that it comes with free shipping? Free shipping. Well that settles it. Time to break out the card! Ironic that it probably takes a high level of shrewdness to become incredibly rich, but once you get there it apparently evaporates. There used to be a review of an amp on one of the music-related sites that was howlingly funny. Wish I could find it, but it looks like the site deleted all the reviews! Can't believe they would do that. There were thousands of them and one of the chief attractions of the site. Sigh.